The SVG College Sports Summit continues to grow in size and scale with each year and in 2018 we are thrilled to celebrate our tenth anniversary with you! Get it into your 2017-18 budgets now and save the date as the college sports video industry’s premier conference and tech exhibit return to the Omni Hotel at CNN Center in Atlanta on May 30, May 31, and June 1, 2018. To reserve your place now or to receive information leading up to the tenth-annual SVG College Sports Summit, please email Andrew Lippe at [email protected]. For technology vendors interested in exhibiting at the event or supporting the SVG College Initiative, please email Rob Payne at [email protected] or Andrew Gabel at [email protected]. Collegiate athletic departments and conference offices of all sizes from across the country have made strong commitments to quality video production and distribution. 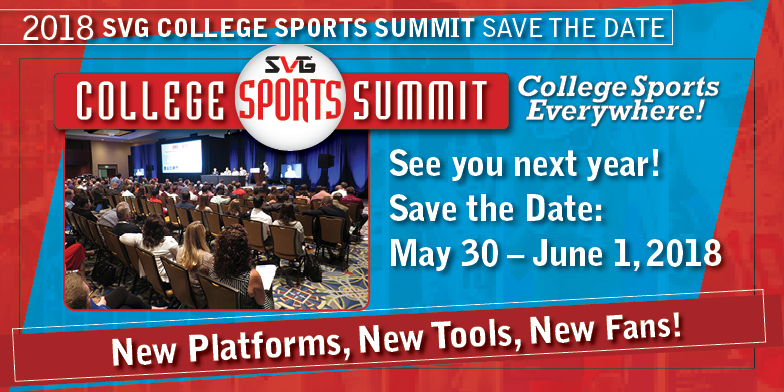 The SVG College Sports Summit is the place to share and get new ideas, keep up on the latest trends, and see first hand the most cutting edge and cost-effective video production gear in the business. To stay on top of all of the latest with the SVG College Sports Summit, visit our webiste at www.svgcollege.com and follow us on Twitter @SVGCollege.